"Why came you here to dwell?" at mile's cross they must hide. The legendary Scottish ballad of Tam Lin is the story of a mortal man captured by the Queen of the Fairies. Tam Lin fears that he will become the human tribute that the Queen pays to the devil every seven years. His true and pregnant love Janet courageously saves him from the fairies on Halloween. The fall holiday has its roots in the Celtic festival of Samhain; a time when it was believed that the border between our world and the otherworld becomes a veil that can be passed through. During this time humans can cross over the the spirit world and that inhabitants of the the otherworld can enter to the mortal realm. Tamlane was illustrated by British artist John D. Batten. 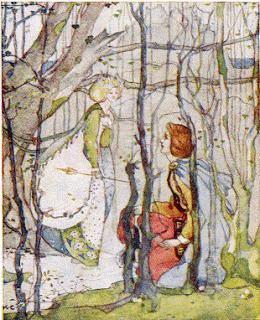 A similar tale is told in the ballad of Thomas the Rhymer who meets the Queen of Elphame. The English illustrator Kate Greenway (1846-1901) depicted the mortal and the queen of the otherworld. Thomas was the probable source for the legend of Tam Lin although the Queen character is more benign in it. When Thomas leaves her realm after seven years she gives him the gift of prophesy. 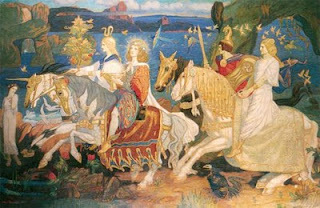 Scottish Symbolist painter John Duncan (1866-1945) shows the fairy folk riding in Riders of the Sidhe.